Entry Criteria: Ship's Officers, Superintendents, Auditors, Service engineers and Repair technicians. Ballast Water Convention requires ballast water to be treated prior discharging it into the sea. Numerous Ballast Water Treatment Systems (BWTS) have been granted IMO Type Approved Certificate. 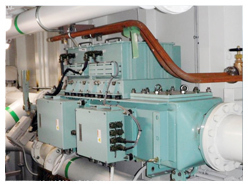 Anglo Eastern Maritime Training Centre (AEMTC), as a first in the world, has installed two fully operational Ballast Water treatment plants, to enable impart training on operation and troubleshooting of BWTS to ships officers, superintendents, service engineers and repair technicians. AEMTC has installed two fully operational and IMO/TYPE approved and USCG/AMS certified BWT Systems. 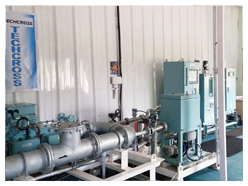 Techcross is a leading Ballast Water Treatment System manufacturer based in Korea. AEMTC has installed a 150 m3/hr Techcross "Electro-Cleen system, fully operational with all the functionalities as found onboard the ship. The candidates undergoing the 2 day course will attain hands on experience of setting up the system, understanding the components, maintenance procedures and trouble shooting at the actual plant site. AEMTC is an approved Training Centre for conducting Techcross courses with expert faculty who have undergone extensive training at Techcross, Korea.